Grounded in my progressive views, I responded, “You’re right, m’ija. Little girls can be baby Jesus, too.” My daughter, I realized, was a feminist and, I, her proud Pops. 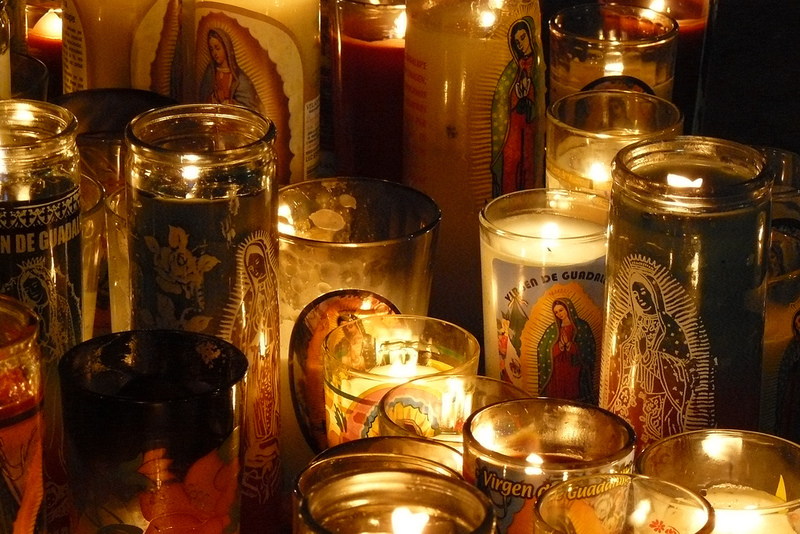 On December 12, when millions of Mexican Catholics celebrate the feast day of Our Lady of Guadalupe and buy roses in her name, I contemplate: How can I ensure that I, a progressive Chicano father, contribute to my daughter’s feminism and faith? When I was sixteen, I saw La Vírgen at her basilica on Tepeyac Hill. My grandmother and my aunt who never had children took a six-hour bus ride with me to ensure I saw the image exalted by Mexicans for centuries. In Chicago in our 26th Street home, my father, silently, without knowing, also showed me to believe. Each morning before he left for work, each evening when he returned, my father made the sign of the cross before another image in our home: the image of La Vírgen de San Juan de Los Lagos. My mother, exhausted from packing and staying up all night, my mother with rollers in her hair that dark morning, crossed herself and prayed for a safe journey. To this day, my mother finds the strength and compassion to advocate on our behalf. My grandmother, my aunt, my mother, my wife–it has been the women in my life who taught me, who instilled in me the ever-lasting importance of faith. “En el nombre del Padre, del Hijo, y Espíritu Santo, Amén. Diosito, por favor cuida a mami, a papi, a yo, and everybody on Earth. My little girl scrunches into her pillow. I lift the pink comforter into the air so it falls without a sound upon her. She closes her luminous eyes, eyes intense as Amaryllis blooms, eyes like her mother’s, and lays her head in comfort on a pretty pillow to welcome dreams. Sitting at her bedside, I ask for the words to explain. Our Lady of Guadalupe is the image our gente turns to when we need God’s help. With a blue cloak of stars, with humble eyes that connect with those of us who pray and present roses at her feet, La Vírgen reminds us of the goodness in the universe, even when we feel we cannot find it. Of this goodness, La Vírgen reminded me when your grandma fought against an illness. Because, m’ija, even as a man with arms strong enough to lift you into the sky and with hands big enough to protect you in an embrace and hold you, as if you were only the size of my own heart, I feel scared sometimes. This is when I turn to the image above the roses, when I need to remember the strength of the Mexican women in my life—the women who have always been stronger than the men—and I ask for the courage, the focus, and the faith to persevere. 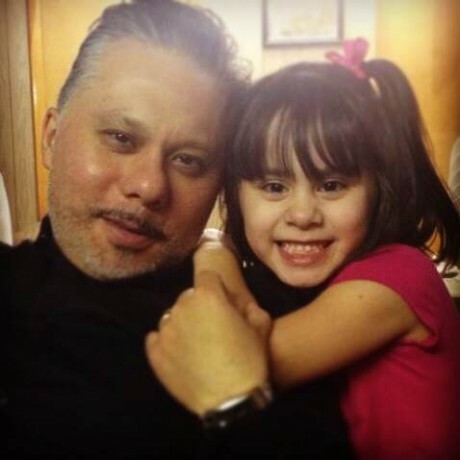 Like most daughters, you, too, will likely enshrine an image of her Papi as a faultless man. Know that I will aspire, every day, to be that good. And this, too, is why I ask La Vírgen to help me be a better man. I think about the moments when you will confront injustice in this world. It’s at that moment I want you to remember that Our Lady of Guadalupe led farm workers, like your grandpa once was, to demand what they deserved: decent pay, safe places to work, respect. Chicanas, like your mother, found in this brown-faced saint a self-recognition and a validation that helped them re-define a passive faith into images of La Vírgen as an independent force. When you see La Vírgen’s image in its traditional form, as Tonántzin, her indigenous name, or in another interpretation of female power, may you always recognize your history. When you look at your own image in the mirror, always find your beauty. Remember, there will always be one man who thinks you are the most beautiful woman in the world. On this December 12, may Our Lady of Guadalupe bless you, inspire you to believe in her, to believe in yourself, and to remember, always, how much your Papi believes in you.